The old woman continued to smile broadly, all teeth and good nature. Her eyes were so squinted up with pleasant spirit that only bits of the black parts were visible. “Well done,” she repeated, confident that the young man could understand her. Well done was, after all, the exact transliteration of the common Luganda greeting Mugyebale and, this was Kampala, the city where most people spoke first and worried only later, if ever, whether their speech had made any sense. It was also a common thing for teenagers to be met by smiling old ladies grinning the words “Well done” at them. Chandler was still a boy. Only fourteen. The sum of his life experiences was still a little figure and he was yet to have seen it all. In fact, he was barely past the opening credits. His brother, who was sixteen, was much more world-weary, evidently, because Frasier had been greeted thus before. It is a thing to be thankful for when you have someone who has walked before you down the confusing pathways of adolescence to guide you on your way. They were standing on a different pathway now: a narrow, windy-and-twisty backstreet of Muyenga, one of Kampala’s wealthier residential areas. All Kampala’s residential areas, no matter how gentrified, have windy-twisty secrets like this. Behind the shiny white maisonette where their mother lived and out of which she had just graciously kicked them, with the very un-maternal words “Either be less irritating or be elsewhere. The choice is yours,” and after they had made what seemed to them to be the far easier choice, they found themselves surrounded by low mud-and-wattle domiciles, barefoot children, and in a corner, a short yellow stand upon which a telephone stood. It was ten thirty in the morning. The sun had just begun to get hot. Frasier’s baseball cap was turned to face backwards, but he was already thinking of, for once, making it face the right direction, if only to keep the sun out of his eyes. Chandler had thought of wearing sunglasses, but even he knew that such a deed would be even uncooler than wearing your cap facing the front. Who wears sunglasses in the morning? The old woman who completed the trio in this little tableau was bent slightly and draped all over in a fraying brown gomesi which may have had a discernible pattern on it at some moment lost in the mists of time but which now looked more as if it had been stained in its entirety. She just stood there and grinned at the boys. Chandler still wondered if she was sane. This was Kampala. Round those parts, sanity doesn’t grow on trees. Meanwhile, Frasier was getting impatient. He describes his attention span as being “as short as… forget it.” So when the old lady opened her rubbery mouth to repeat the words a third time, Frasier’s impatience cut her off. “What can we do for you this morning, grandmother?” he asked in Luganda. Better not risk any further transliterations. His Luganda was, technically, polite, and his question was worded with the requisite respect for elders, but his tone was full of everything that is the opposite of respect. However, the woman hadn’t been savvy enough to pick on the fact that the confusion that blazed off the boy’s face when she first said the words “well done” would not dissipate if she repeated it, so she did not pick up on the fact that the other boy was sneering and snarling with impatience underneath his breath. “Good morning and how was your night?” she beamed, because she was of a generation which does not stop greeting until at least a half hour has elapsed. This is one of the greatest obstacles to bridging the gap between the young and the old. The young are always in a hurry. The old have spent their whole lives wasting time and are not ready to break the habit yet. Not any time soon. Any time soon is not a concept they accept. “I don’t really know. I was asleep for most of it,” Frasier replied. The impatience was beginning to show. The woman responded by humming one key. This is the traditional way of letting your correspondent know that you are ready for them to ask you, in turn, how your own night was. “Is there something we can do for you?” Frasier asked, his teeth now gritted. “My night was fine,” the old lady said, and hummed again as she warmed up for the next stage of the greetings. Chandler, meanwhile, had moved on from being so bewildered by her first words and was now in awe. She seemed impervious to sarcasm, even though Frasier was all but beating her over the head with it. “This woman is bulletproof!” he exclaimed. After they had bought some chapati, some mandaazi and passed on the sweet banana pancakes because it irritated Frasier that everyone called Kabalagala “pan” yet it wasn’t freaking pan, they finally got past the old lady and moved on to what it was that had them out of bed at this ungodly hour. The telephone which sat on a little stool painted in cracked yellow, with the logos of a number of mobile telecom companies inexpertly plagiarized along its length beneath the words “Paypohne. One Unnit 40 secs”. A very bored young woman barely looked up from her stupor to take their money and poke at the keys on her phone as Frasier recited the number of his father’s phone to her. “Who is this?” growled the other end. In life there are choices, and then there are things that just look like choices but are actually forgone conclusions. Like any argument between Frasier and his father. They can go on for as long as the phone battery lets them but in the end there will be only one victor. And it has never been Pappa Dawg. The two boys took after their mother in this way. The last time he had ever had his way during any dispute between himself and her was when they were named during their infancies. As a fan of the hit television sitcoms of the time, he had been dying to name his sons after their star characters. Solome, their mother, was not keen on the names Chandler and Frasier, but claiming that their father insisted on naming them and there was nothing she could do was the only excuse she could use against her clan elders who would want the boys named after her grandparents. Solome did not want children named Jechonia and Zerubabel. So a few hours later, there was a knock at Muzeeyi’s door and a bad word being spat out of his mouth. He kicked his slippers on, heaved himself up from his sofa and waddled up to the door to open it. “A classic never goes out of style, my boy. I will watch 24 until, if ever, I die. How come there is only one of you? Where’s Chandler?” he asked, looking out of the doorway and up the drive to see if the other boy was approaching. Frasier let himself into the house and walked straight to the DVD player. “Truth be told, I have no idea. I was with him when we got to the taxi stage. I was with him when we stopped the taxi. I was with him when I asked the taxi conductor if he will ever make enough money to afford a bath and that the last I remember seeing him.” And that was when Muzeeyi’s mobile phone bleeped. The older man’s voice trailed away to silence as he watched the boy and realized that his speeches were being lost on the air. Frasier was standing in front of the television. He poked at the DVD player. The tray slid open. He picked out the disc on it, sneered at it and all but threw it away. He scanned the pile of DVDs on the cabinet. His father gave up and turned back to the phone to dial for help. When Chandler and his brother were reunited, it was to share bad news. Frasier’s face was dour and his tone was morose. The flap of his baseball cap drooped behind his head. He usually walked with that off-axis waddle boys of his age affect after watching rap videos starring people named “Lil” Something and tugging their trousers downwards, but even now, a casual observer could tell that this was no ordinary waddle. There was misery and woe in every unbalanced step as he made his way to the mall bench where his brother sat waiting. “How was Mukono?” he asked. Chandler ignored the jibe. Chandler nodded melancholically to acknowledge the sadness of this fact of their family life. It was not easy being from a broken family. Frasier met the question with a stoic look. Chandler lifted his sagging jeans a bit so that he could take the bad news in comfort. “What is the job?” he asked when he was ready. “We are going to be waiters, you man!” said Frasier. Everyone else on that floor of the mall turned to look at them, expecting to see a doctor standing before them telling them something they had was inoperable. “We are going to be waiters…” Frasier repeated. “Nooooooooo!” Chandler repeated as well. This was supposed to be an upper-middle class haunt, this mall. It was meant to attract a clientèle from a certain social stratum. You know. Snobs. So when Chandler exploded again with “Noooooooooo!! !” many of them prepared to call the police. Ugandan writer, Ernest Bazanye is well known for his weekly column Bad Idea in The New Vision. You can read more of his craziness over at Ernest Bazanye. Shut Up. I’m Thinking. 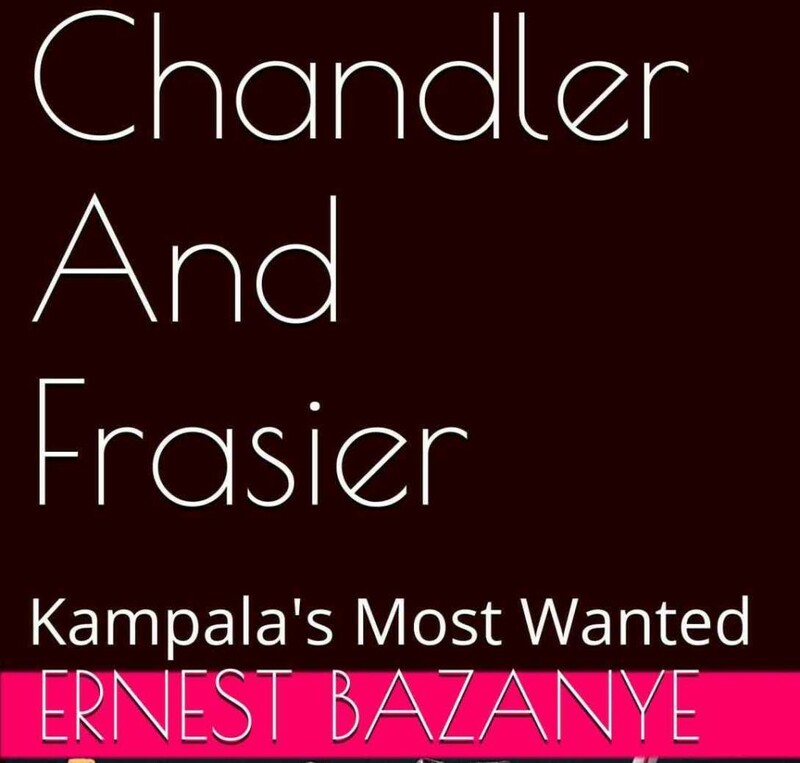 His new book Chandler and Frasier: Kampala’s Most Wanted is available on Amazon. Buy it. For his The Neverman Project: Short Fiction Experiments, go here. For a free download of his The Ballad of Black Bosco, go here. Oh yes, i bought it…and had a good laugh!